Tag along as I sketch and doodle my way through the blogosphere. We recently returned from a two-week trip to Paris and Mallorca, of which I shared a bit via Instagram. This is the first of a series of posts I’m planning as well to help Rich and me remember some of our favorite moments and memories from our recent travels. Our “Parisian Eaves” room on Hotel des Grands Boulevards’s top floor. Blind luck led us through the Place de la Concorde (where we first spotted the Eiffel Tower in the distance), and into the Tuileries Garden with wide gravel walkways, fountains, flower beds and perfect topiaries that felt like a true welcome to the French city. 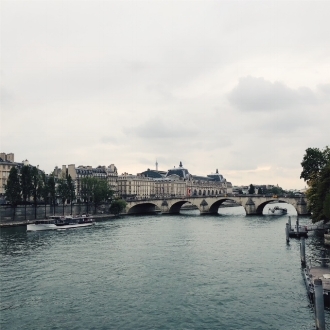 We then passed by the Louvre, right on the other side of the Tuileries, as we continued on our way in the direction of Saint-Germain-Des-Prés, toward Angelina on Rue du Bac. Passing by the Louvre, right on the other side of the Tuileries. You happen upon picturesque scenes at almost every turn while walking in Paris, making me miss living in Washington D.C., similar in that it was designed by French architect and urban designer Pierre Charles L'Enfant. I love walkable cities with a sense of history. Crossing over the Seine. How could this ever get old? That’s the cafe Le Saint-Germain tucked into a breathtaking example of building architecture in Paris. 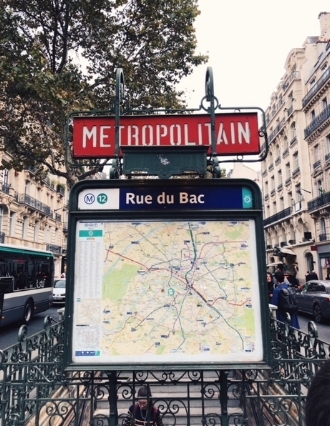 Even the street maps and metro signs are pretty in Paris. 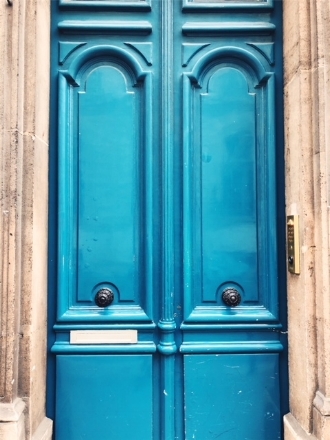 Bright-painted doors (which reaffirmed my decision to paint our own front door at home a Bunny Mellon-inspired green) and flower shops kept distracting me and I began to lose focus on our ultimate goal: hot chocolate. Luckily, Rich was there to keep me semi-focused. The hot chocolate—which had the consistency of a melted chocolate bar—was worth our pilgrimage. The shade of pink on the to-go cups at Angelina made the hot chocolate that much more delicious. As we made our way back to the hotel, we stopped at a café for dinner a few blocks from the Eiffel Tower, and decided on a whim to purchase tickets to the summit. It was late so lines were short, and we made it all the way to the top. I love the picture below because it perfectly reflects how we felt that night. A bit hazy. Exhausted from a 9-hour flight before walking miles around the city. But elated to be there together. It would be one more café stop and a long walk before we returned to our hotel that night, happy to rest our sore feet and excited to finally be flying to Mallorca in Spain the following day. Riding the elevator to the top of the Eiffel Tower and standing high above the twinkling city was spectacular, as you’ll see in the video below. That’s the Palais de Chaillot visible across the Seine from the Eiffel Tower, and if you look carefully you can spot the Arc De Triomphe in the distance as well. All content and images created by and © Paulette Pearson. View all policies here.